To reduce your cost, Brandsport offers this item in Bulk (sold here individually). Gorilla also lists this same item in 4-piece sets as Display Package # 41137BC and Bag # 41137BCB. Gorilla lug nuts are engineered to exacting standards for uniformity and long life. You can match your factory lug nuts with a quality replacement of Gorilla Black lug nuts. 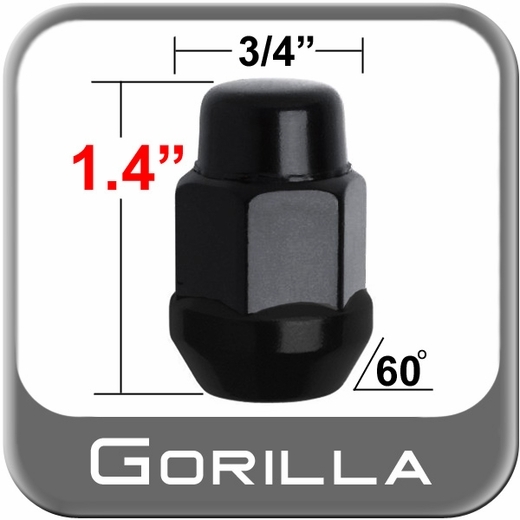 You can reduce vehicle vibration when properly installing a new set of Gorilla Black lug nuts. When replacing your wheels, don't forget to replace your lug nuts with Gorilla Black lug nuts..